Aldridge, Ira Frederick, b 1805 in New York City or Belair, Maryland, d 10 August 1867 in Lódź, Poland. African-American tragedian. In the 1820s Aldridge acted in amateur theaters in New York. After emigrating to England, he made a highly successful debut on the London stage in 1826 in the role of Othello. In the 1850s he performed mostly in Europe and won high acclaim, particularly in Russia. 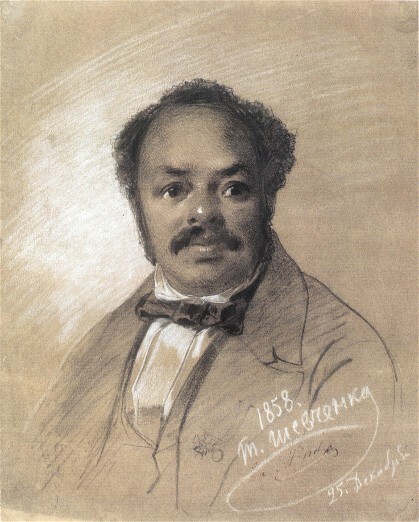 Aldridge's first performance in Saint Petersburg on 10 November 1858 in the role of Othello was witnessed by Taras Shevchenko. Shevchenko and Aldridge became friends. Shevchenko admired the actor's talent and attended all his performances in the capital. He sketched a portrait of Aldridge in 1858. In 1861–6 Aldridge toured several cities in Ukraine—Kyiv, Kharkiv, Odesa, Zhytomyr, and Yelysavethrad—and became acquainted with a number of prominent Ukrainians.